Easy and simple stir fried gochujang sauce! Today, I want to share a magic sauce that will instantly become your favorite condiment. You might already know or at least have heard of gochujang, right? 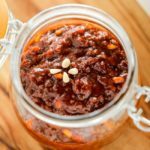 Gochujang is an essential Korean condiment and it’s basically the Korean version of chili paste. 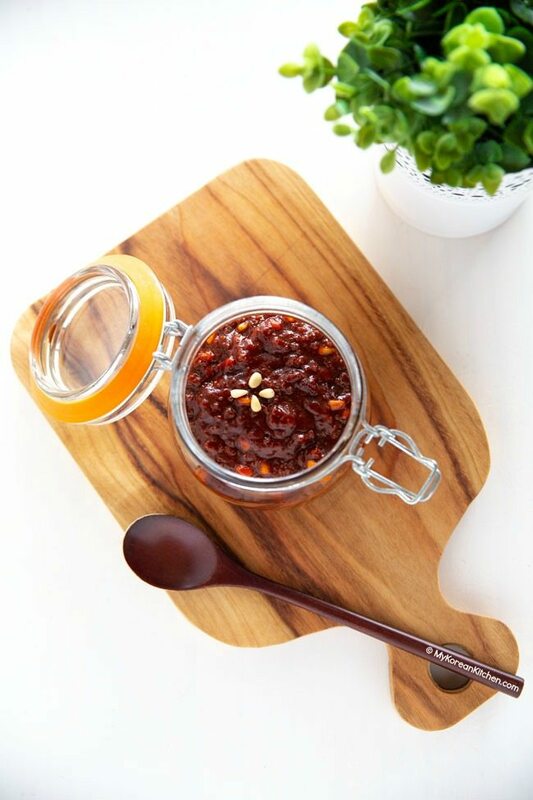 You can read more about gochujang from here. Now you might be wondering what yak gochujang is? Yak gochujang (약 고추장) translates to medicinal gochujang. That’s because one of the ingredients used in this dish is honey and it used to be considered as medicine in the olden days of Korea. Though, based on the cooking techniques used, I will call it stir fried gochujang sauce from here onwards. Stir fried gochujang sauce is literally gochujang that is stir fried. 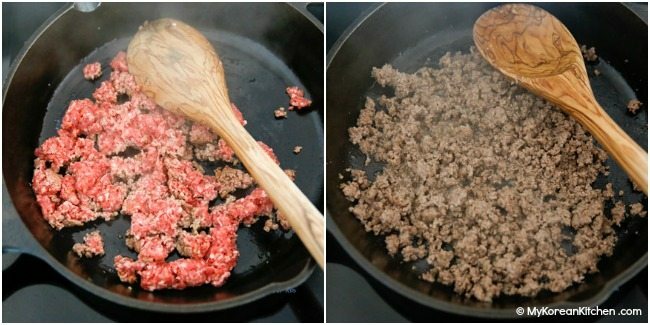 But its flavor and the texture is enhanced by adding some fine meat (usually minced beef or pork) as well as other seasoning, which includes some honey. Depending on the amount of honey you use, you can intensify the spiciness of the sauce. As an example, the sauce will be a lot spicer when you use only 1 tsp of honey compared to when you use 1 Tbsp of honey. So I will leave the decision up to you. If you’re not much of a meat lover, you can substitute the meat with some mushrooms too. If so, shiitake mushrooms would be the best. 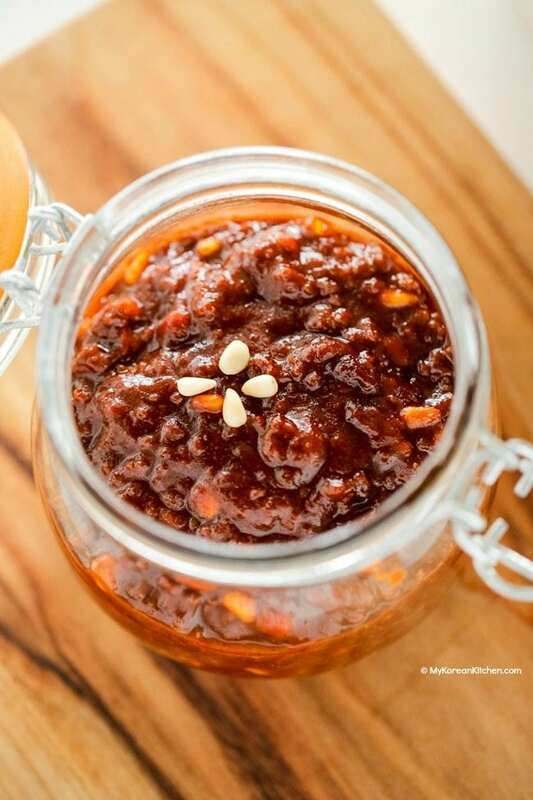 The beauty of this gochujang sauce is that once you make a fair amount of it, you can store it in the fridge for up to one month and conveniently use it as your needs arise. Basically it becomes your emergency condiment! Emergency as in, when you don’t want to cook / when you feel like being lazy, you can simply take out this sauce and serve it over some leftover steamed rice. The simplicity of the bowl contents can extend as much as you want to prepare other ingredients. As an example, in the last few weeks, when I didn’t have much time to cook, I just served my family with some steamed rice, fresh salads, egg and this sauce in a bowl. It resulted in a very simple yet wonderful bibimbap! What’s more, if I feel even more lazy, I just serve the sauce with steamed rice, that’s it. That’s my super lazy lunch. LOL. Anyhow, I just want to compare my regular bibimbap sauce with this stir fried gochujang sauce as a bibimbap sauce in case you are curious. But the most obvious difference would be that today’s recipe contains meat in the sauce whereas my regular bibimbap sauce doesn’t. As I mentioned a few times already, you can use stir fried gochujang sauce in bibimbap. Bibimbap is a popular Korean mixed rice bowl, in case you’re not aware. Since this sauce itself contains some protein and it’s seasoned, you can prepare your bibimbap much quicker. Also, you can use the gochujang sauce as a dipping sauce in rice lettuce wrap. This is how the king of the Joseon dynasty used to eat the sauce. Finally, you can use the sauce as a filler when you make some rice balls (like Japanese onigiri). I will share the link to my recipes as these become available. Are you ready to give it a go? I hope you’re convinced! Enjoy! P.S. If you like a multi-purpose sauce, you might also like to try spicy canned tuna! 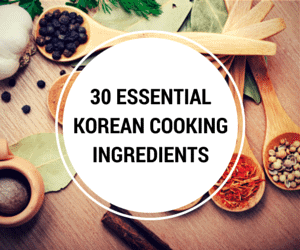 ** If you want to learn more about Korean ingredients, check essential Korean ingredients list. 1. Combine the meat with the marinade sauce and set it aside for about 5 minutes. 2. Pre heat a skillet over medium high heat. Add the sesame oil and spread it thinly quickly. Add the meat and stir it well so the meat doesn’t clump. 3. Once the meat is mostly cooked, add the gochujang and water. Stir them well for 2 to 3 mins. Reduce the heat to low and simmer it a further 8 mins. Add the honey and pine nuts then stir. Simmer it a further 2 mins. Remove from the heat. Cool it down and store it in an air tight container until needed. It can be refrigerated for up to one month. 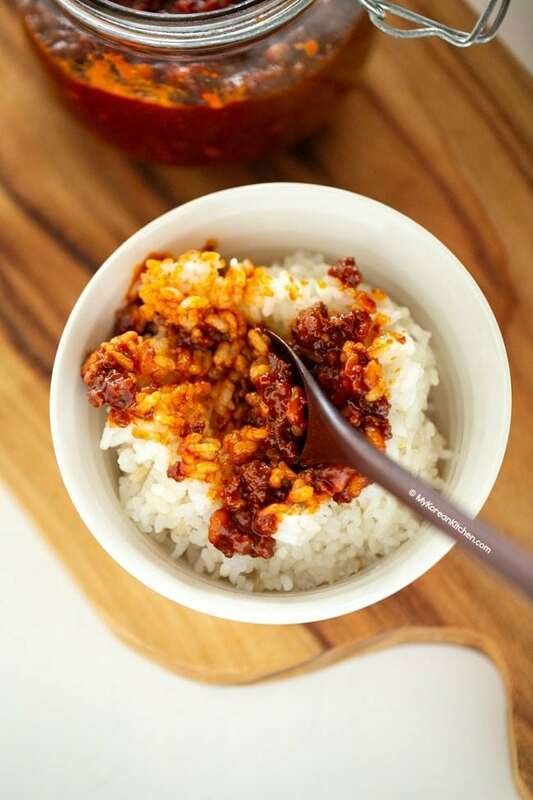 How to make stir fried gochujang sauce with minced beef or pork. It's super easy! Combine the meat with the marinade sauce and set it aside for about 5 minutes. Pre heat a skillet over medium high heat. Add the sesame oil and spread it thinly quickly. Add the meat and stir it well so the meat doesn’t clump. Once the meat is mostly cooked, add the gochujang and water. Stir them well for 2 to 3 mins. Reduce the heat to low and simmer it a further 8 mins. Add the honey and pine nuts then stir. Simmer it a further 2 mins. Remove from the heat. Cool it down and store it in an air tight container until needed. It can be refrigerated for up to one month. How exotic! I love Korean food so this sounds like a good change of pace. Thank you for another great recipe sue! !This gochujang sauce looks yummy and tasty!!! Hi Sue! What wonderful recipes! I am allergic to MSG and other preservatives..I had to toss my new tub of gojuchang ☹️..is there a gojuchang alternative or homemade recipe so I can omit the preservatives? Hi Karen, Check this gochujang. https://amzn.to/2KolR0x It claims that no chemical additives or preservatives are added. Thank you so much for sharing your recipes. And I am so glad that I happen to find your blog. I love cooking and want to try cooking Korean food. I love Korean food. My question is what is that flour Korean used in making a street food they call fried mix vegetables. Again thank you. Hi Judith, I’m glad that you found my blog too! Maybe this is what you’re looking for. https://amzn.to/2qV8zQl Should be available from any Korean grocers. In the recipe card above, you can adjust the serving size. Just hover over your mouse above the number “15” then a blue bar will appear. You can adjust the serving size from there. Hope this helps! Thank you so much for the recipe. Just wanna ask you about the rice wine. 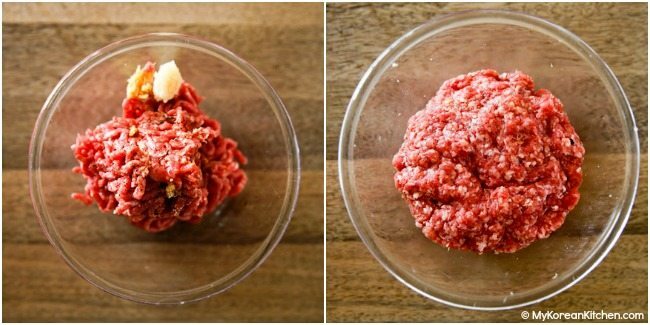 Do you mix it to marinate the meat or when you cook it? Can I skip the wine if I don’t want to? I will try with iceberg lettuce. Good to hear that it turned out well! I’ve been looking all over for the name of the sauce that I can use to make bimbibap! Thanks so much! Where do you find the sauce (i.e. does Whole Foods have it)? Hope you enjoyed the sauce. 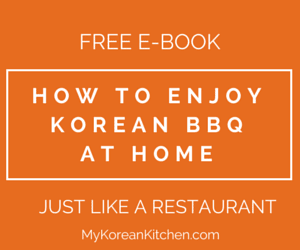 Great blog, you’re doing a wonderful thing by sharing with everyone your Korean recipes. I’m Chinese living in Taiwan, and I love Korean food. I hope to see you expand the “quick food” section hehe. I will do my best! 😉 Stay tuned!! do you need to keep the sauce in kimchi refrigerator or just a normal fridge? what should the temp be about? do you need to heat up the sauce or can you just consume it from the fridge? Wow, do you have kimchi fridge at your home? Lucky you! You must love Korean food so much. Anyway, well I don’t have a Kimchi fridge at home, so I can’t tell you the temperature it should be kept. But the sauce does not need to be heated before you use it again. Just use it straight from the fridge. I must say your recipes look really tempting! My hubby and I always have a deep liking for korean cuisine. Your website really help loads in me making korean dishes for my hubby! Glad to find yr blog. It seems to be lots of new information you’ve discovered. Hi! I found your site while looking fro a recipe for Bi Bim Bap and I fell instantly in love with it. I love all your recipes and your photos are beautiful! Hi Sue!! I just recently discovered your site and I love it!! It has so much fun information and beautiful pictures! I just tried this recipe and it was super easy to make and tastes sooo good!! When I go to the Korean supermarket now, I’ll be buying a bigger Gochujang paste! Thank you for all of your hardwork!!! We all enjoyed your Simple Bibimbap. It’s delicious! I made double the recipe and have heaps on hand for those days when I don’t feel like cooking or just for the sake of having something yummy to eat. Most of the ingredients from your site are pretty easy to find in the states, so this is great!! does anyone know how lond this will last in the fridge? I think this recipe and the sauce you bought are different in terms of main ingredients they used, but a bit similar in its usage. 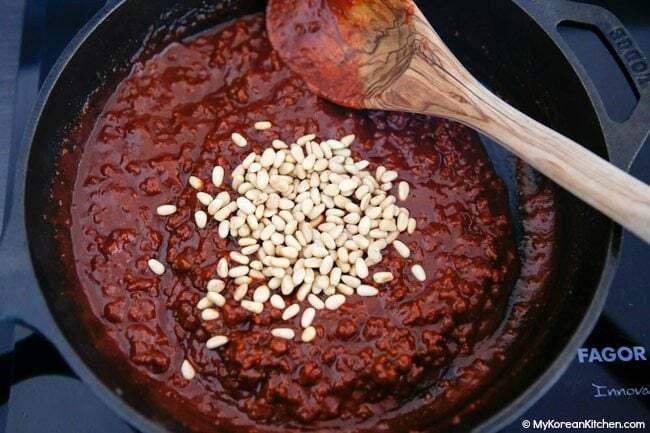 The paste I used for this recipe is Gochujang (chili paste) and yours is Doenjang (soybean paste). So they are different. Thanks for posting this! Because I bought two packs called “Traditional Gangdoenjang sauce” and “Pond Snail Gangdoenjang sauce” and I was thinking how I should prepare it even though there are the pictures on the packs. Are your recipe and the packs I bought similar or the same? Thanks! Wow… this looks delicious! It’s an added plus that the sauce can last 3 months!!! Yum! I can’t wait to try this one. You’re amazing; I don’t know how you post so frequently. 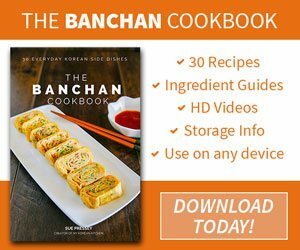 I cook Korean food everyday and I can barely keep up with you. I just made your fabulous jajang myun tonight only I made jajang bap instead. Came out GREAT! Thanks!!! I really cannot tell you how glad I am that I found your blog. Thank You for putting so much effort into it. It is truly appreciated!! !